Dickens's Sketches by Boz, Vol. 1 of the Charles Dickens Library Edition, Chapter 4, "The Election for Beadle," facing the title-page. 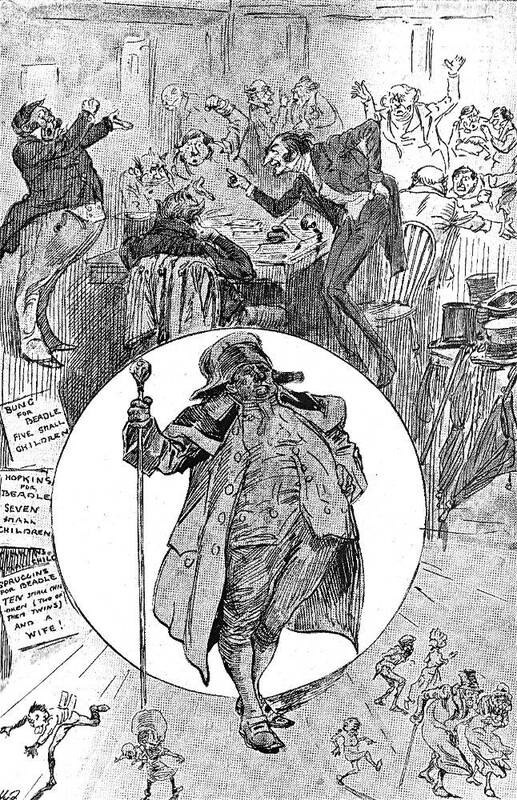 Fin-de-siécle illustrator Harry Furniss's interpretation of the chapter in which the Parish officials, having suffered the death of their beadle, dare to hold an election rather than merely appointing a successor — and thereby triggering a contest between the forces of Tradition and those of Reform. The breath was scarcely out of the body of the deceased functionary, when the field was filled with competitors for the vacant office, each of whom rested his claims to public support, entirely on the number and extent of his family, as if the office of beadle were originally instituted as an encouragement for the propagation of the human species. 'Bung for Beadle. Five small children!' — 'Hopkins for Beadle. Seven small children!!' — 'Timkins for Beadle. Nine small children!!!' Such were the placards in large black letters on a white ground, which were plentifully pasted on the walls, and posted in the windows of the principal shops. Timkins’s success was considered certain: several mothers of families half promised their votes, and the nine small children would have run over the course, but for the production of another placard, announcing the appearance of a still more meritorious candidate. 'Spruggins for Beadle. Ten small children (two of them twins), and a wife!!!' There was no resisting this; ten small children would have been almost irresistible in themselves, without the twins, but the touching parenthesis about that interesting production of nature, and the still more touching allusion to Mrs. Spruggins, must ensure success. Spruggins was the favourite at once, and the appearance of his lady, as she went about to solicit votes (which encouraged confident hopes of a still further addition to the house of Spruggins at no remote period), increased the general prepossession in his favour. The other candidates, Bung alone excepted, resigned in despair. The day of election was fixed; and the canvass proceeded with briskness and perseverance on both sides. 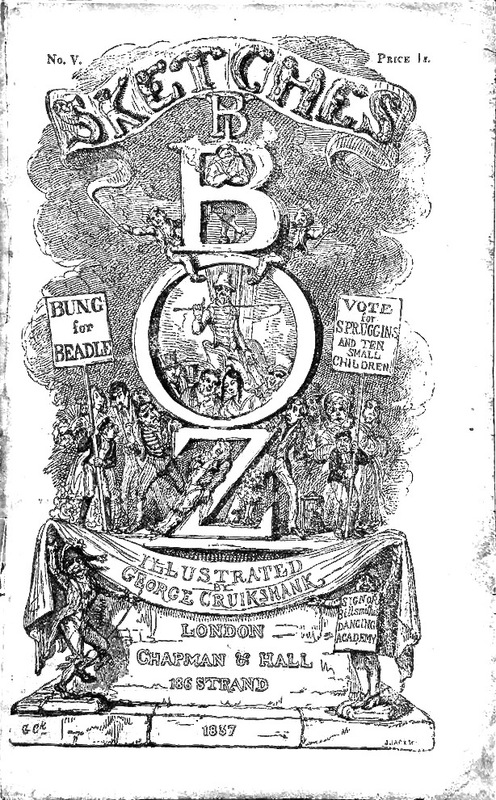 Several of the chief Victorian illustrators of the London sketches, George Cruikshank and Fred Barnard, and the first great Dickens illustrator of the twentieth, Harry Furniss have all singled out "The Election for Beadle" for visual comment — possibly because they recalled that when Dickens included this unimportant local contest in what became Sketches by Boz it commented on the the major topical issue of electoral reform, recently fought in the House of Commons in the debates over The Great Reform Bill of 1832. This, the fourth of the Dickens "Parish" sketches, originally appeared without illustrations in the Evening Chronicle on 14 July 1835, one of the periodicals to which Charles Dickens, then a twenty-three-year-old reporter, occasionally contributed. This The election of the parish beadle provides a foretaste of the highly fractious, partisan Eatanswill Election described in the Pickwick Papers. The election is actually somewhat unrealistic since most parishes appointed rather than elected their beadles. 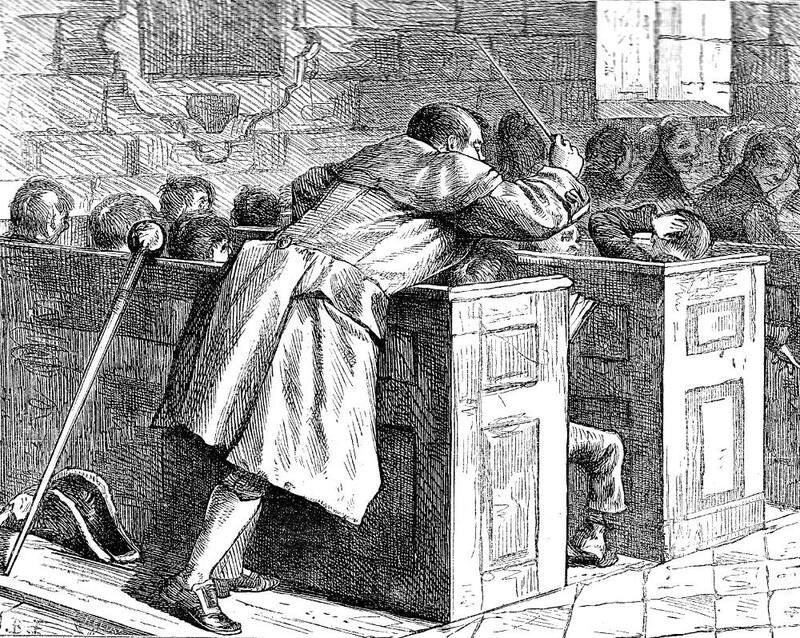 Dickens uses this parochial contest as yet another opportunity to pit traditionalists against reformers, in this case the Ladies' Bible and Prayer-book Distribution Society versus the Ladies' Child Examination Society; albeit a ridiculous and even venial contest between candidates Smuggins ("Ten Small Children and A Wife") and Bung ("Five Small Children") in which financial need rather than ability is the keynote that appears on the signs of the opposing factions. A new beadle is needed after the death — perhaps from heart-attack or stroke — of Simmons, who "had over-exerted himself, a day or two previously, in conveying an aged female, highly intoxicated, to the strong room of the work-house." The conservative, "official," or traditional party of the Vestry, headed by the elderly owner of a dozen houses in the district — "the steady advocate of the churchwardens, . . . [an] unflinching supporter of the overseers" (13), has aligned itself behind Spruggins (stage right); the reformist opposition, the local ratepayers, upholding the time-honoured principle of vociferously standing up to whomever or whatever the official party advocates, are the proponents of the ridiculously-named Bung. 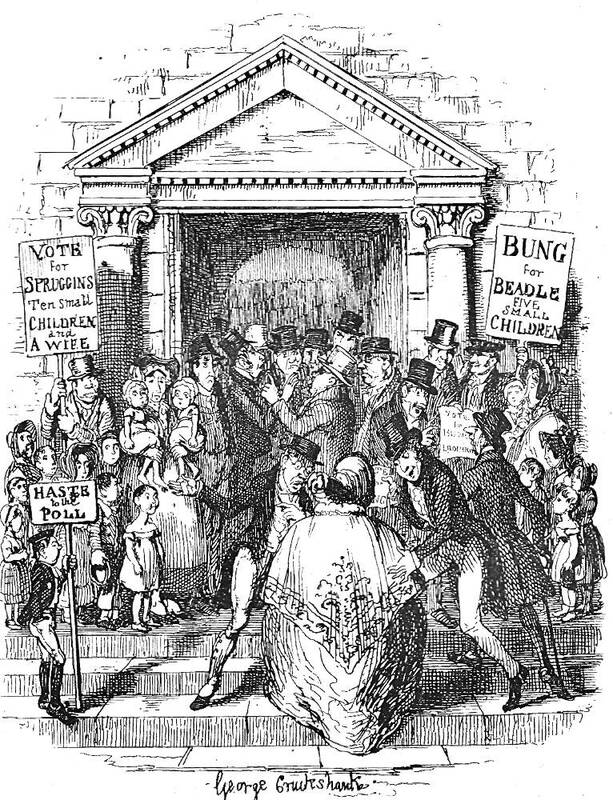 Left: George Cruikshank's original serial illustration of the same scene, with the supporters of the contestants, Spruggins and Bung, demonstrating outside the parish vestry, Election for Beadle (1835). Centre: George Cruikshank's monthly wrapper design for the Chapman and Hall serialisation (November 1837 through June 1839). 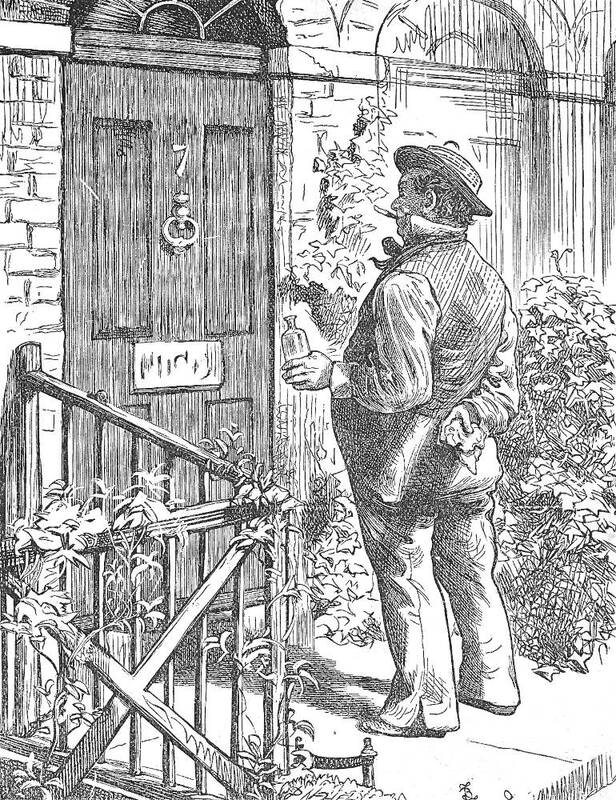 Right: Fred Barnard's 1876 Household Edition illustration of the half-pay captain who leads the Reformers, The half-pay Captain completely effaced the old lady's name from the brass door-plate in his attempts to polish it with aqua-fortis — "Our Parish," Ch. 2. Dickens, Charles. "The Election for the Beadle." "Our Parish. "Sketches by Boz. Illustrated by George Cruikshank. London: Chapman and Hall, 1839. Dickens, Charles. "The Election for the Beadle." "Our Parish. "Sketches by Boz. Illustrated by Fred Barnard. The Household Edition. London: Chapman and Hall, 1876. Vol. 13. Pp. 9-12. Dickens, Charles. Pictures from Italy, Sketches by Boz and American Notes. Illustrated by Thomas Nast and Arthur B. Frost. New York: Harper & Brothers, 1877 (copyrighted in 1876). Dickens, Charles. Sketches by Boz. Illustrated by Harry Furniss. The Charles Dickens Library Edition. 18 vols. London: Educational Book, 1910. Vol. 1. Dickens, Charles. "The Election for the Beadle." Sketches by Boz Illustrative of Every-day Life and Every-Day People. Ed. Thea Holme. The Oxford Illustrated Dickens. Oxford: Oxford U. P., 1957; rpt., 1987. Pp. 18-24. Long, William F., and Paul Schlicke. "Bung Against Spruggins: Reform in 'Our Parish.'" Dickens Quarterly 34, 1 (March 2017): 5-13.